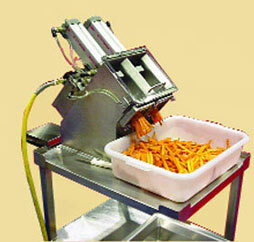 Similar to the Electric Dual Stick Cutter except the air-driven cutter allows product placement for specific cuts. To operate, the Lexan door is opened and the product is placed in the V-shaped trough. When door is closed air automatically pushes the product through blades for precise cuts. Includes blade and pusher set.